The Cougars swept past the competition last weekend with three straight wins to clinch the 2016 title. Cherry Hill East senior Stephanie Yanosov won all of her matches at last weekend’s Moorestown Classic. 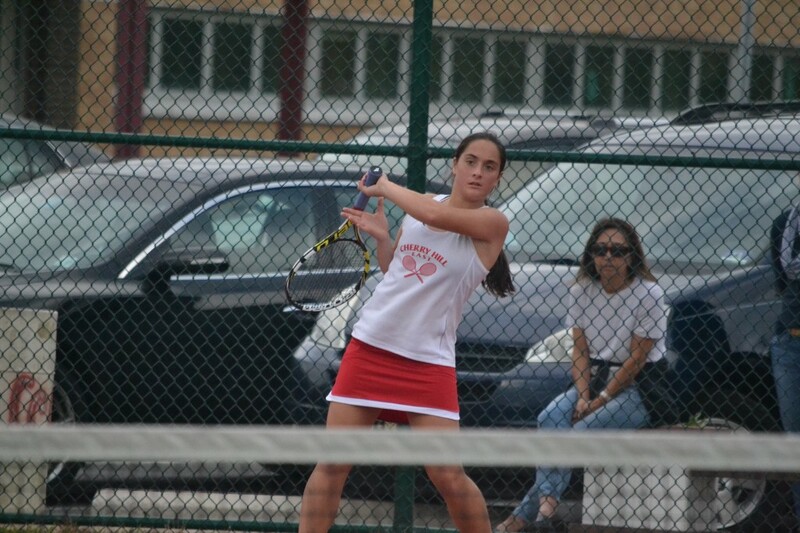 Cherry Hill East girls’ tennis is off to a great start in the 2016 season. Over the weekend, the Cougars swept through the Moorestown Classic tennis tournament at Moorestown High School, winning three straight matches to bring home the championship. Cherry Hill East’s run started on Saturday against Moorestown Friends School. The Cougars won the match easily, 4–1, with all four of their wins coming in straight sets. Stephanie and Natalie Yanosov won their matches at first and third singles, respectively. Sarah Jang and Rebekah Colacot won at first doubles, 6–1 6–1; and Mari Kimenker and Sanjana Doshi won at second doubles, 7–5 6–2. On Sunday, the Cougars’ success continued as they edged out Kent Place School, 3–2, in the semifinals. Both Stephanie and Natalie Yanosov again won their matches, with Natalie’s win decided in a 10-point tiebreaker. At first doubles, Colacot and Jang also went to a tiebreaker, edging Kent Place’s duo of Grace McGinley and Kelcie Engles, 10–5, in the tiebreak. Cherry Hill East followed up its semifinal win with a 4–1 defeat of Moorestown High School in the championship match. Stephanie Yanosov and Pallavi Goculdas won their matches in straight sets. The Cougars won both doubles matches in three sets to clinch the title. Counting their Moorestown Classic wins, the Cougars are a perfect 6–0 to start the 2016 season. Their next match takes place on Wednesday at Cherokee High School.